Wanna stuff your face with a saucy smothered bean 'n cheese enchilada without a gazillion irritating calories and fat grams? 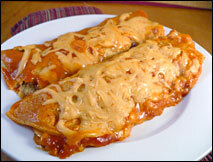 Just whip up a batch of these Lean Bean Cheesy Enchiladas PRONTO! 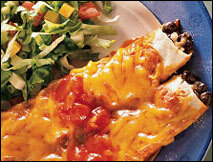 Enchiladas are like skinny burritos, bathing in cheesy, saucy goo (which sounds AWESOME to us!). We LOVE them! But oily corn tortillas that are exploding with fatty cheese and refried beans, drowned in sauce, and covered with even MORE cheese are not exactly diet-friendly. And since restaurants typically serve up ginormous double headers of these things with mounds of rice and MORE beans on the side, an order can easily exceed 1,000 calories and insanely depressing amounts of fat. Even worse is the fact that while you can GUESS how many calories are in that order, you may never know for sure. We say play it safe and cook up some enchiladas in your own kitchen -- you'll save yourself oodles of calories and fat grams. HG's version is as easy as it is cheesy (and that’s a pretty ROCKIN’ combination). Share the enchilada love with humans who loooooove Mexican food. Click “send to a friend” NOW!